Research • Other slides also have shaped the park, but U. of U. geologist says there is no sign that another catastrophic event is imminent. Bill McGuire | Special to The Tribune The Virgin River cuts through the Sentinel slide path, seen on the left, in Zion Canyon on May 19, 2016. 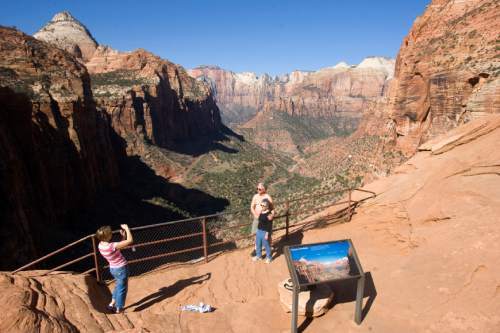 Al Hartmann | The Salt Lake Tribune Hikers pose for a picture looking into Zion Canyon from the Canyon Overlook Trail. 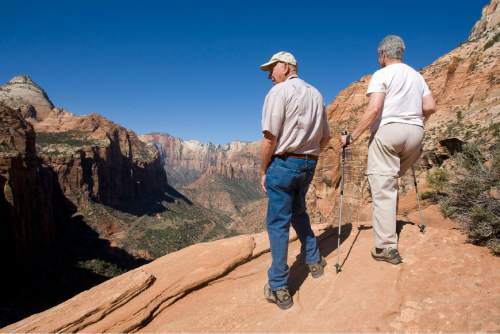 Al Hartmann | The Salt Lake Tribune Hikers look into the Zion Canyon from the Canyon Overlook Trail. Bill McGuire | Special to The Tribune Zion Canyon seen from Observation Point on May 20, 2016. 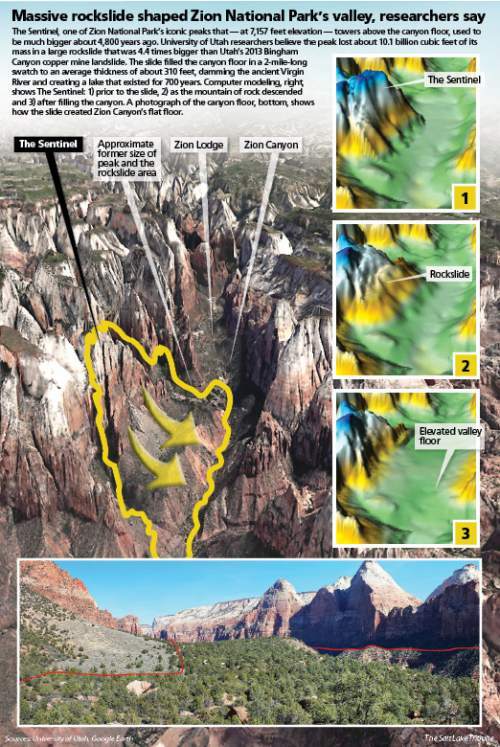 How a massive rockslide shaped Zion Canyon The Sentinel, one of Zion National Park's iconic peaks. At 7,157 feet in elevation, it towers above the canyon floor, but it was once much larger. University of Utah researchers have determined that 4,800 years ago, it shed 10 billion cubic feet of sandstone, a volume 4.4 times larger than Utah's 2013 Bingham Canyon slide at the Kennecott Utah Copper mine. The debris buried the canyon floor in a 2-mile-long swath to an average thickness of 310 feet, damming Virgin River and creating a lake that existed for 700 years. Computer modeling, right, shows the Sentinel: 1) prior to the slide; 2) as the mountain of rock descended; and 3) after filling the canyon. A photograph of the canyon floor, bottom, shows how the contours of what's left of the debris, nearly half of which has been eroded away. 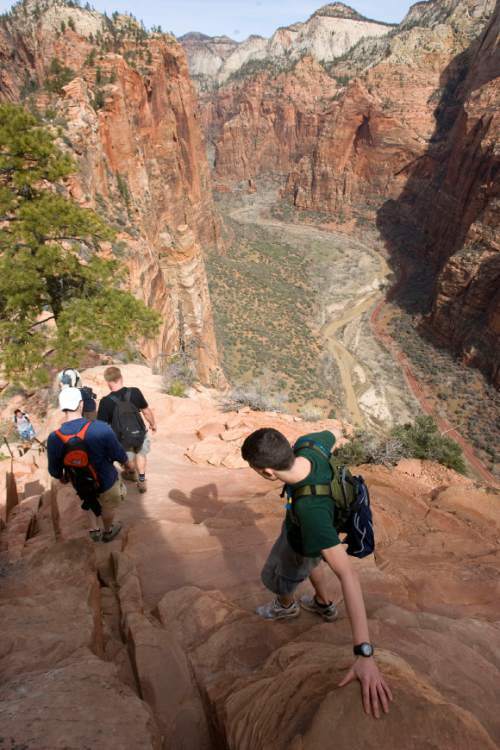 Al Hartmann | The Salt Lake Tribune Hikers pick their way down Angels Landing Trail looking into the valley floor of Zion National Park. The Sentinel, a sandstone formation on Zion Canyon&apos;s western wall, was once much larger. But over the course of a cataclysmic minute 4,800 years ago, it disgorged 10 billion cubic feet of broken Navajo and Kayenta sandstone that poured up and down the canyon. Debris flows reached speeds of 180 mph before settling into a plug 2 miles long and a mile wide, according to new research from the University of Utah. Rising 300 feet above the canyon bottom, the slide blocked the Virgin River, forming a 2-mile-long lake that persisted for 700 years in what is now Zion National Park. The resulting sedimentation leveled the valley floor, which otherwise would have featured rugged banks plunging to the river. "This catastrophic landslide of massive proportions had two effects," said U. geologist Jeff Moore, lead author on the study posted Thursday. "One was constructive  creating paradise through cataclysm. More than 3.6 million people last year enjoyed the flat and tranquil valley floor of Zion Canyon, which owes its existence to this landslide. The other aspect is the extreme hazard that a similar event would pose if it happened today,"
Scientists first reported the existence of the slide in 1945, but Moore and his team are the first to precisely characterize the event in terms of time frame, size, dynamics and consequences. "We were excited about the findings and we will definitely weave it into our interpretive programs," said Aly Baltrus, Zion&apos;s interpretation chief. Park visitors pass through the slide area as they ride or drive up the canyon above the State Route 9 turnoff. The Virgin River continues to cut through this material, which remains unstable. It unleashed a slide in 1995 that damaged the road. 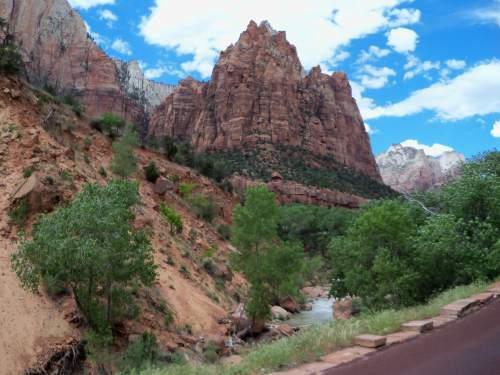 Visitors can hike or ride horses on the western side of the debris field along the Sand Bench Trail, accessed from the Court of the Patriarchs bus stop. The debris piled up to 650 feet on the canyon side and averaged more than 310 feet in height. Moore&apos;s research team dated the slide using a technique that determines how long rock has been exposed to open sky. When cosmic particles strike rock surfaces, beryllium-10 builds up in the rock. Because this element accumulates at a known rate, the amount of beryllium present in a sample can reveal how long ago slide debris separated from its original formation. Moore&apos;s team gathered 12 blocks of sandstone the size of notebooks for the tests and nine yielded similar results, dating the slide to 4,400 to 5,200 years ago. This is about 3,000 years younger than previous calculations, meaning the slide occurred much more recently. By mapping the contours of the pre-slide canyon floor and the top of the debris field before the Virgin started eroding it away, Moore&apos;s team concluded the slide contained 286 million cubic meters of rock, about 4.4 times the size of the 2013 Bingham Canyon slide that disrupted production at the nation&apos;s largest copper mine. The rock blocked the Virgin River, which formed a lake that backed up 2 miles to the Narrows. The place where Zion Lodge sits was under 380 feet of water. Over the centuries the lake bed filled with sediments, creating the broad level canyon floor people enjoy today. Scientist know that this was a year-round lake because the sediments contained shells of a species of mussel that would have required a sustained, deep-water lake environment, Moore said. Retired National Park Service geologist Wayne Hamilton, using his own money, had previously used another dating technique to estimate the time frame of the lake&apos;s existence, placing it between 3,900 and 4,300 years ago. Moore&apos;s research refined that to the 700 years following the slide. "We know there was a lake because we have these layered lacustrine clay deposits. There&apos;s lots of places to see them," Moore said. Eventually, the Virgin overtopped the debris field and began incising through it and the lake level dropped. Moore&apos;s research concluded that the river has carried off about 45 percent of the debris. "The river is really steep here and carries a lot of energy. As it erodes you get little slides along the incised walls. The latest was in 1995," Moore said. "As the thing keeps eroding, this kind of thing will keep happening." Moore&apos;s research could not determine what triggered the slide. An earthquake is a possibility, but the paleoseismic record contains no evidence of an earthquake occurring at the time of the slide. 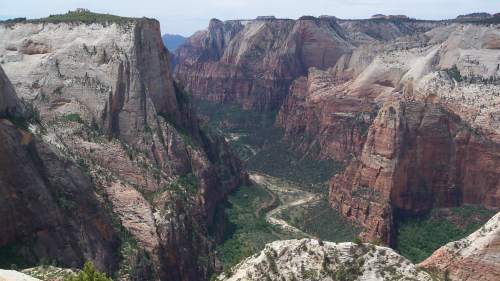 Moore noted Zion has experienced other valley-blocking slides, like one 2,600 years ago that hit Hop Valley in the northern part of the park. This event dislodged about one-fifth the amount of debris. Yet Moore said there is no evidence to suggest another cataclysmic slide is imminent. His study is the cover story in the June edition of the Geological Society of America&apos;s journal "GSA Today." It was funded by the U.&apos;s David and Inga Chapman Fund. Collaborators included graduate student Jessica Castleton, now employed with the Utah Geological Survey; Jordan Aaron, a geological engineering doctoral student at the University of British Columbia; and Marcus Christl and Susan Ivy-Ochs, rock-dating experts at the Swiss Federal Institute of Technology in Zurich.